As a black child growing up in inner-city neighborhoods in Philadelphia and Los Angeles, John Baugh witnessed racial discrimination at a young age and began to notice correlations between language and race. While attending college he worked at a Laundromat serving African Americans who were often subjected to mistreatment by the police. His observations piqued his curiosity about the ways that linguistic diversity might be related to the burgeoning Civil Rights movement for racial equality in America. 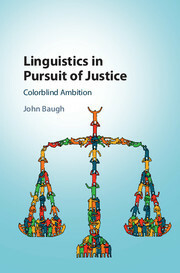 Baugh pursued these ideas whilst traveling internationally only to discover alternative forms of linguistic discrimination in Europe, Africa, Asia, Australia, the Caribbean and South America. He coined the phrase 'linguistic profiling' based on experimental studies of housing discrimination, and expanded upon those findings to promote equity in education, employment, medicine and the law. This book is the product of the culmination of these studies, devoted to the advancement of equality and justice globally. 1. Introduction; 2. Linguistics, life, and death; 3. Linguistics, injustice, and inequality; 4. Some linguistic and legal consequences of slavery in the United States; 5. Linguistic profiling; 6. Earwitness testimony and unbiased formulation of auditory line-ups; 7. Dialect identification and discrimination in the United States; 8. Formulating discrimination: dimensions of a historical hardship index; 9. Linguistic harassment; 10. Linguistic contributions to the advancement of justice; 11. Shall we overcome? John Baugh is the Margaret Bush Wilson Professor in Arts and Sciences at Washington University, St Louis. He is best known for advancing studies of linguistic profiling and various forms of linguistic discrimination that were supported variously by the Ford Foundation, the Rockefeller Foundation, the National Science Foundation, the Department of Housing and Urban Development and the United States Department of State.